Padar Island easily steal many hearts of travelers. It is devastatingly gorgeous with rugged terrain surrounded by gradient blue water. Throughout the year, the jagged hills are changing from vibrant green early on the year to crips savannah during the dry season. Prepare to have your breath taken when you come to this island. You will be greeted with the island’s unusual shape, otherworldly top-hill view, and the rare three coloured beaches. Padar is probably the most photogenic island in Indonesia and traveler’s favorite, but it’s more than a selfie spot. Beneath all the beauty, this island have its own story. Here are five facts about Padar Island that you might haven’t know about before. The Komodo National Park comprises with three large island, the Komodo Island, Padar, and Rinca, and 20 other smaller islands. Padar is located between the other two and is the smallest among the three. The island has a little bit rougher topography than others in the National Park. The paths is steep with hills set against deep bays—each bays has different color of sands. The Pink Beach in Padar is one of the most famous. After all the robust outdoor activity, the pink beach is perfect for a pleasant leisure. Lying in the blushing sand, this beach will transport you to a cotton land. But do you know how could the beach turn so pink? The pinkness actually come from foraminifera, a microorganism that cause a red tint to corals. These red corals lies right in the seabed of Padar, under the clear blue water. When the sea currents hit the corals, they break into tiny pieces of grain and washed off to the shore. They mingle with the white grain sands and turn the beach into a soft pink sands! Speaking about the beautiful Pink Beach, you should remember that the shore is still a part of Komodo National Park. That means every elements on the island is protected and that includes the sands. I know it’s very tempting to scoop a little of this shining pink sands into a bottle as a token. It might seems harmless, but imagine if a hundred of other travelers think the same. Let’s leave the beach as pink as you find it at first. Do you know that the island is part of ‘Wallace Line’? This line marks the meeting point of south and north currents, which results on abundance of marine biota. The island is also a part of coral triangle, where millions of corals and marine species bloom with life. Under the water, Padar boasts two magnificent diving sites: the Pillarsteen and Three Sisters. The Pillarsteen is famous for its beautiful canyon, underwater caves, and high rock pillars where it got its name from. Both diving sites are home for pelagic and unique marine species, such as yellow frogfish and hump-head wrasses. Who can think that beneath those dry and rugged mountains, lies a wonderful underwater life? While Komodo and Rinca Island are teeming with the ferocious Komodo, Padar is totally Komodo-free. They Komodo has long left Padar due to the lack of food in the island. Slowly, their population in Padar was getting extinct—some were migrating in the neighbouring island. Rumour says that there’s still two naughty Komodo roaming the island, but this is not true. The good news is, you can enjoy the hike and chill in the beaches without getting sniffed by the lizard! 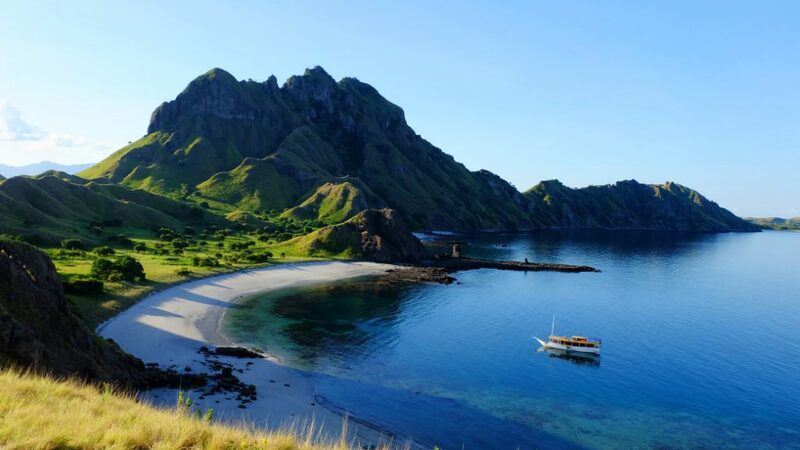 Now, are you ready to enjoy all what Padar Island has to offer?